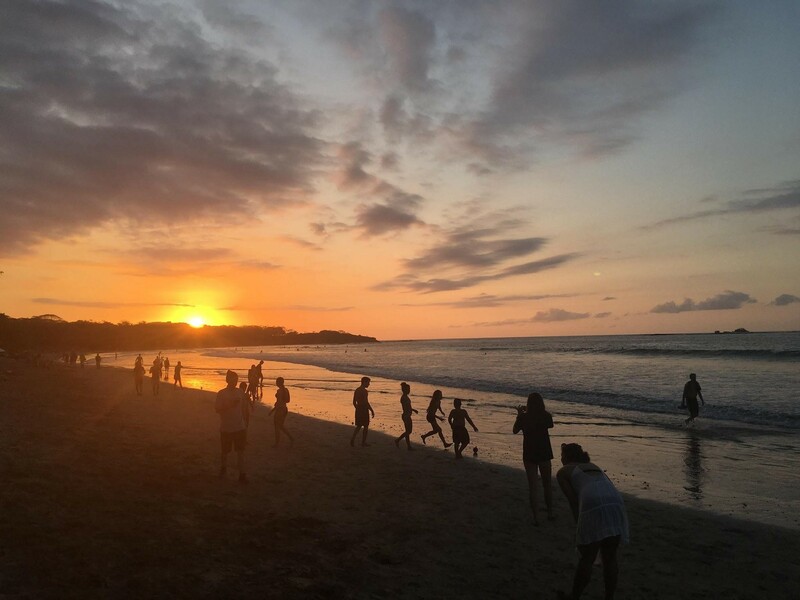 Illinois State University student Brendan Flynn shares his experiences studying abroad in Costa Rica. Flynn participated in the Veritas University program during fall 2018. In eighth grade I took a single Spanish class, and years later I decided to spend three months in a country where most people only know how to speak Spanish! And to top it off, I got to spend it living with a host family who did not know any English, crazy right? Well, absolutely not. In my three months in Costa Rica, my Spanish went from un poquito to mucho mejor. I absolutely knew that my Spanish ability was almost cero, but that only made my experience much more exhilarating. 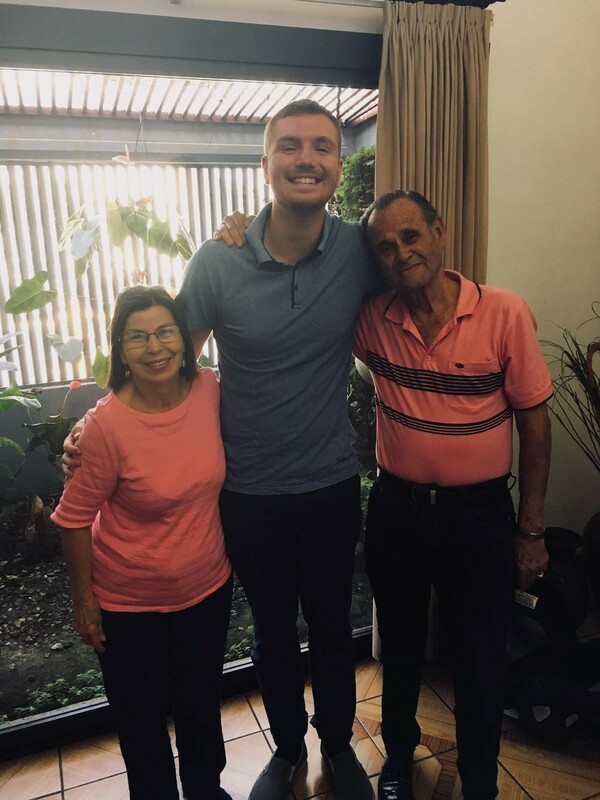 My dear host parents, Nydia and Rodolfo, are to credit for my improvement by being incredibly patient and understanding as I tried to formulate anything that sounded somewhat correct. As they welcomed me into their beautiful home that first day, I couldn’t help but use my hands to signal for a pen and some paper, because I had no idea how to say anything. After a lot of scribbling what resembled my Spanish, and a lot of “Si,” I knew that if I wanted to speak at all, it would have to be in Spanish. So that was how it was going to be, and it resulted in some of the coolest moments of my life. My host dad, Rodolfo, loved watching T.V. at all times. Soccer was always a hot topic in conversation; but what was really interesting was when we watched American football, the most confusing sport on this planet, and I had to explain the rules, in Spanish! By no means an easy task, but it was incredible explaining something I knew so well in a language I did not. My host mom, Nydia, loves to paint. Her work, which is unbelievably good, was hung all around the house for everyone to see. We would talk about our favorite art and what it means to us, which was so engaging! But it wasn’t only what we talked about that was wonderful, but how a new worldview of friendship, family, and love was displayed to me. My host stay, although at times difficult, was one of the coolest, most rewarding opportunities I have ever had, as it truly provided me a second family. I also did a little studying. I took four courses at Veritas University while I was in Costa Rica: Afro-Caribbean Studies, Contemporary Latin American History, Theory of Latin Dance, and Tropical Marine Biology. These courses furthered my academic experience. Afro-Caribbean Studies, with one of my favorite professors, was a course that offered insight to many struggles, triumphs, and issues of black Caribbeans. Contemporary Latin American was a course filled with laughs and engagement. We covered historical issues from the independence of Latin America to the relevant topics today. For Theory of Latin Dance, I learned about so many genres of music like cumbia and mambo, and learned how to dance a little bit of salsa and merengue. We even had a field trip to go to a disco in San Jose, where we put all those dance moves on display! And finally, I learned many fascinating things in Marine Biology. This course dissolved my irrational fear of sharks. A little stat I learned, on average humans kill 100,000,000 sharks a year, while sharks only kill six humans! I also learned about the effects of climate change, and how they are not only devastating the ecosystems that are on land, but also in our oceans. We also went on two field trips, one to the Caribbean and the other to the Pacific. We went snorkeling and collected data for the various projects that we each had to do. It was absolutely surreal. Oh, and also at Veritas, there are no tests! We had all sorts of projects, debates, and discussions within class. This was especially exciting, as I am a history-social sciences education major here at Illinois State. With this system, I got to experience fun and educationally inspiring activities in my courses that I plan to implement in my own classroom. While I loved the university and the courses I took, I also enjoyed some time outside of the classroom. San Jose is located in a valley surrounded by mountains, and often some friends and I went hiking on our favorite trails. One time hiking, we encountered some local cows grazing on the mountainside, so we decided to spend spend an afternoon and hang out with them. I also got to do a lot of firsts, like zip line across literal valleys. I had never been zip-lining before, and it surely did not disappoint. Going from one mountain side to another while watching a green horizon that stretched endlessly took my breath away. I also had the opportunity to whitewater raft through the rain forest. Aside from the rush and excitement of the rapids, it was quite a peaceful experience sitting in the stillness of the water, hearing the waterfalls flow into the river and the birds singing. All this while looking up and seeing trees and rocks that towered above, giving me one of those chilling too good to be true moments. I also had the chance to visit black and white sand beaches, and swim in the bluest water I have ever seen in my life. Every bus ride was stunning, because it meant that you had to pass through the mountains or by a volcano. I couldn’t keep my eyes off the window. But one of my favorite moments was watching the prettiest of sunsets throughout my time. Whether it was the sun setting over the mountains and neighborhoods of San Jose, to a cotton candy sunset over the Pacific. It was beautiful, magical, and something I will not forget. Overall, I think every single person who has ever fancied studying abroad should just go for it. Financially, a worry for many including myself, there are various scholarships waiting to be applied for! Financial Aid also carries over from ISU, so I actually found myself paying less in Costa Rica than here at home. Educationally, you will have the opportunity to take courses that ISU does not have available. There is nothing at ISU like taking Marine Biology or Latin Dance! Or if you study history, like myself, you are able to receive a Latin American perspective, which is invaluable. Socially, you will make so many friends and meet people from all over the world. I met people from Australia, Germany, Chile, England, and all parts of the U.S.A. You get to hear the most fun and unique travel stories, because there are many, and form friendships that last beyond your time together. Plus, you will have free places to stay for future travels! I think studying abroad is such a unique opportunity that everyone should take advantage of. There are of course challenges, as moving across the world for any amount of time is not easy. But, the things worth doing are never easy. Part of my heart will always be in Costa Rica. People with different backgrounds from all parts of the globe converged on this beautiful country as the same time as me, and I cannot be more thankful and grateful for it being so. 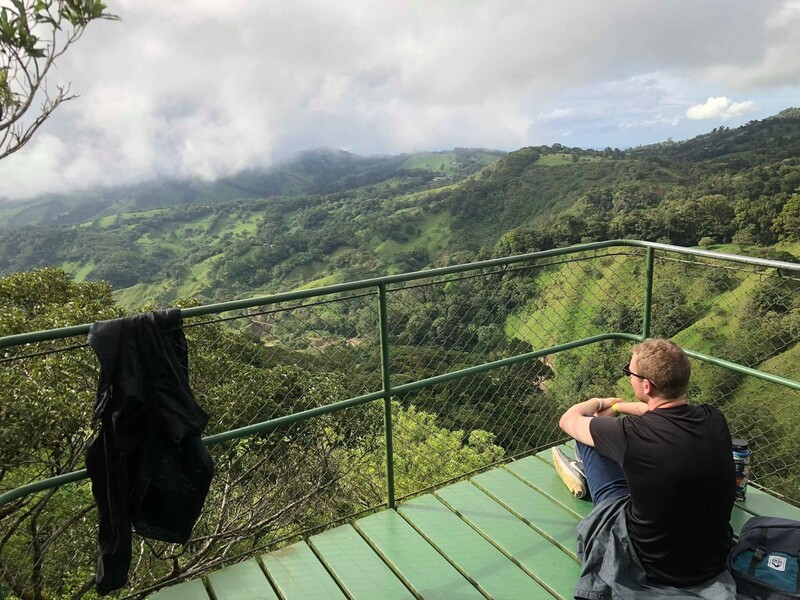 From the first sight of those rolling green mountains, I knew Costa Rica was special, and that there was adventure to be had.